Joey Masciantonio pins a U.S. 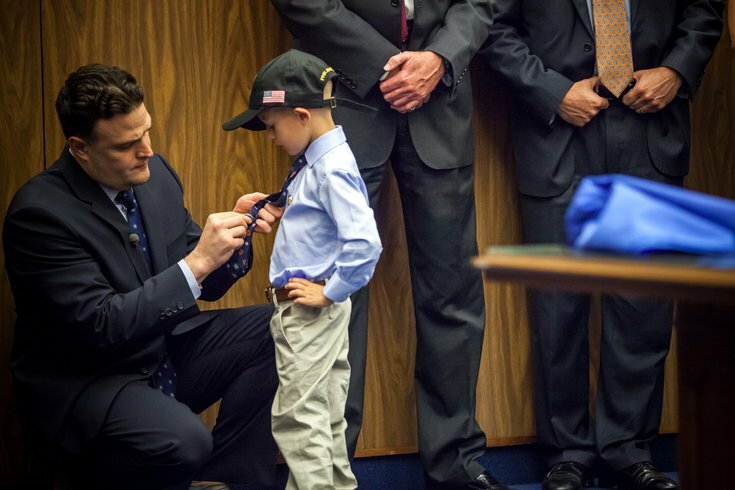 Marshal badge on his son Dominic, moments after he was sworn in as an Honorary Deputy U.S. Marshal. The FBI calls it the "Miracle on Market Street." It was a moment during Pope Francis' visit to Philadelphia in September that the Masciantonio family of Warrington, Bucks County, will never forget. On Saturday, Sept. 26, the first day of the visit, the pope traveled down Market Street, where he met one-year-old Gianna Masciantonio and kissed the young infant on her head. What the pontiff didn't know at the time was that little Gianna was suffering from a very rare form of histiocytosis. A potentially fatal tumor was growing on her brain stem. After that kiss, however, the Masciantonio family has seen the tumor on Gianna's brain stem shrink. The Masciantonios were standing on Market Street that day thanks to a thoughtful FBI agent, but more on that later. On Tuesday, the U.S. Marshals Service put Gianna's five-year-old brother in the spotlight. Honored for his devotion to his sister and love of the law enforcement community, Dominic was an honorary Deputy U.S. Marshal. "It's just an absolute honor to be here," said Joey Masciantonio, the children's father, during the event at the James E. Byrne Courthouse at 6th and Market streets. "He's been the constant picture of strength through all of this." As he was being sworn in by David B. Webb, U.S. Marshal for the Eastern District of Pennsylvania, the young boy gleefully announced his own name – with a room rousing shout of "Dominic!" – and vowed that he would always protect his young sister. He received his own badge and a too-big hat that he wore with pride. William F. Sweeney Jr., the special agent in charge of the FBI's Philadelphia office, also presented the Masciantonio family with a photo of Pope Francis kissing Gianna. The framed photo was signed by the pontiff, as well. It was fitting that Sweeney helped commemorate the event, as the FBI had a unique hand in setting up that fateful moment by helping Gianna to meet Pope Francis. Dominic Masciantonio is sworn is as an Honorary Deputy U.S. Marshal by U.S. Marshal David Webb, (center with red tie). 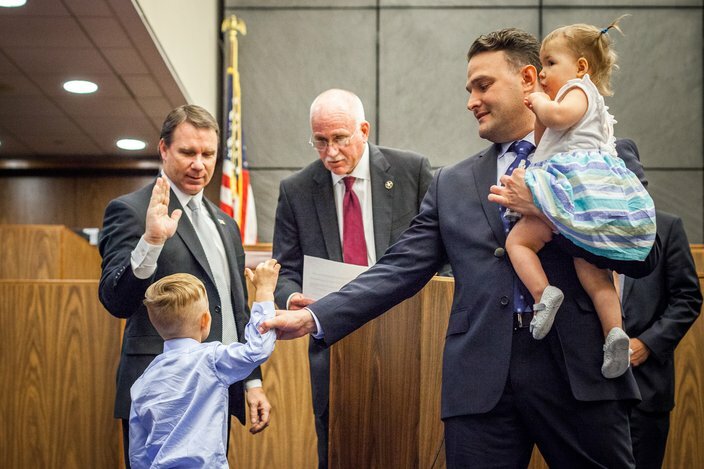 Dominic's father, Joey Masciantonio, right, holds his sister Gianna and helps him raise his right hand during the oath. According to FBI agent Don Asper, he met the family after a mutual friend told him about Gianna's condition and asked him if the agency could pull strings so that the little girl could meet the pope during his two-day visit here for the World Meeting of Families. Obviously, Asper said, FBI agents didn't have any special clearance – the pope has his own security staff and the Secret Service was involved – and Apser couldn't help. But he remembered Gianna later when family members of FBI employees were given a last-minute chance to stand along Market Street on the Saturday of the pope's Philadelphia visit. Asper called the Masciantonios immediately. "We didn't know it was going to work out like it did," said Asper with a laugh on Tuesday. 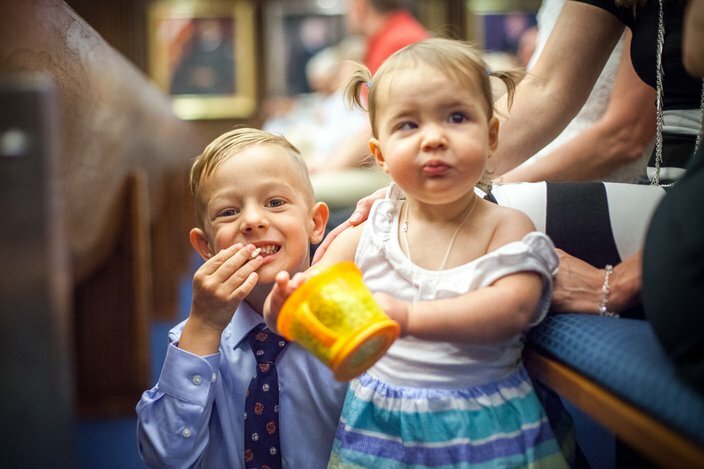 Dominic Masciantonio and his sister Gianna share some Cheerios moments before he was sworn is as an Honorary Deputy U.S. Marshal in the Ceremonial Courtroom of the James E. Byrne Courthouse in Philadelphia. So the Masciantonios joined members of the FBI and their families along Market Street. Asper said he was "right in front" near the family when the papal motorcade came down the street. Everyone around the Masciantonios waved and shouted, trying to get the pope's attention, then pointing to Gianna and screaming Francis' name, Asper remembered. And with that, the popemobile stopped. A papal security official grabbed Gianna from the crowd and passed her up to the pontiff. Pope Francis kissed Gianna on her forehead. Since that moment, his daughter's tumor has indeed shrunk, Joey Masciantonio said. The "Miracle on Market Street" was more than a blessing in the form of a papal kiss, he said, but the love and support that helped his entire family get to that moment after struggling to accept Gianna's diagnosis. "His kiss didn't heal Gianna," said Masciantonio. "The miracle was all the people that came together... This wasn't just some miracle that day. It was hope... I don't know if I can truly explain the feeling." Masciantonio said the family learned about Gianna's disorder about a month after she was born. For many months, he and his wife, Kristen, endured the scary "15 steps" from their bed to Gianna's crib every night, always hoping they'd see her smiling face "but fully prepared for the worst." While her condition has improved, Masciantonio said his 19-month-old daughter still has three to six more rounds of chemotherapy at the Children's Hospital of Philadelphia to remove the remaining tumor and some cysts. The family is rallying behind Gianna and they are hopeful that one day her disease and the wretched treatment will be a faded memory he can tell her about "when I walk her down the aisle." "Our hope is that she won't remember one second of this," he said. But, he said, Gianna's family will never forget the kiss from a pope, nor the efforts from those who helped get her there.